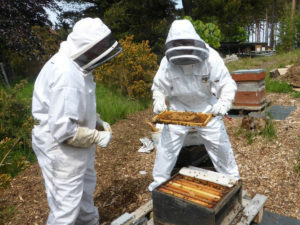 When the Findhorn Hinterland Trust was first formed in July 2015, it inherited two active beehives, three sets of protective equipment, a solar wax extractor and other minor pieces of bee related equipment from the community organisation the Findhorn Hinterland Group. The hives and equipment were bought to use as practical tools to help increase awareness of bees and beekeeping in the local area by encouraging people to get involved under the experienced eyes of John Willoner and Jonathan Caddy who are FHT trustees and both have kept hives locally and elsewhere for many decades. 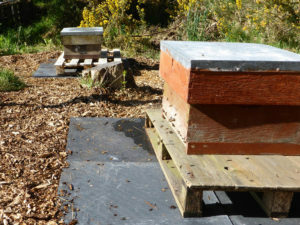 The hives were sited next to the Edible Woodland Garden and form part of that on going project. How this land based educational opportunity works in practice is that John and Jonathan take responsibility for the hives and work them along with their own that are situated nearby. They offer trust members and others the experience of working with the equipment, exploring the inside of the hives and learning a bit about the fascinating life of bees and the art of beekeeping. Any honey surplus from all the hives worked is split between the FHT and the tutors. It is hoped that the hives will provide a focus for local people to explore if this is a skill and interest that they wish to take further without having to initially invest in their own equipment and not have to travel far to gain this experience. 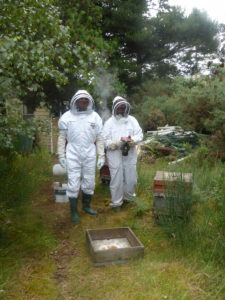 After these initial taster sessions they would be encouraged to get involved in the excellent local association, the Moray Beekeepers Association with their apiary in Elgin, skilled practitioners and more formal courses and tuition. Weather wise, this was not a good season for bees with a cold spring and slow early summer and although August and early September were better, the resultant honey crop was poor. There were also other challenges – when opened up in the spring, the strongest hive was found to have either a queen who was laying drones or a laying worker which meant that the colony was going to die out if nothing were done. All possible steps were taken but still no new queen was produced and the hive was eventually united with the second hive on the site. Later queen cells from elsewhere were established as a potential new small colony in August but this was not successful and the bees were reunited with the other hive in September. 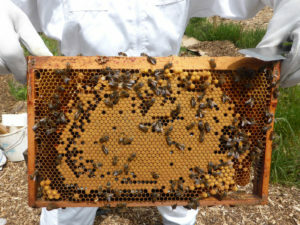 So with one strong colony on site, it is hoped to create a new hive early in the spring and with good weather (?) get the apiary back to full strength next year. In the 2017 season, John and Jonathan wish to encourage members to sign up for regular tutorials and practical sessions throughout the active season and to organise equipment beforehand. Ideally, this group could eventually manage the FHT apiary collectively. Parallel to this John and Jonathan will be working with young people to introduce them to the world of bees so will be approaching local pre-school, school age and youth groups – the future of bees and beekeeping is in their hands. More pictures can be found in the photo gallery. Interested? Contact [email protected] for more information and to find out how to join in activities.